Tonight, for the first time in this World Series, we got some action throughout the game and drama at the end, an extra inning's worth, even. Each league's probable MVP hit a home run, while another star continued to have one of the worst World Series I can remember. San Francisco struck first, as they have all series, but Detroit managed to fight back and take the lead for the first time all series. Of course, they didn't keep it. And with the Giants winning 4-3 in the 10th though, there's now no baseball for months... So many months... Too many months... I guess I'll have plenty of time to brood about that later, for now let's just look back at Game 4 and the 2012 World Series. The first inning was uneventful. Miguel Cabrera walked, but Prince Fielder struck out. Fielder had probably the worst World Series by anyone since at least 2008 (when Tampa Bay's Evan Longoria had his own nightmare series), going just 1 for 14, with 4 strikeouts, 2 double plays. He reached base just twice (on a single and a HBP), and after the HBP he wound up getting thrown out at the plate when he slid to the wrong side of the plate. In the second inning the Giants got a ground rule double from Hunter Pence, followed by a triple from Brandon Belt, and took the lead. In the third they threatened again, putting two runners on, but didn't score. In the bottom of the inning, Detroit's Austin Jackson drew a walk, then Miguel Cabrera hit a high fly ball to right field. There was just enough oomph and just enough wind to carry it over the wall. Detroit had its first lead of the series. The fourth and fifth innings passed without incident, but in the top of the sixth Buster Posey gave the lead back to San Francisco with a two-run homer of his own. Delmon Young didn't want to let GOOD players have all the fun though, so he hit a home run of his own a few minutes later and the game was again tied. Young now has 8 postseason home runs for Detroit, a franchise record. That's somewhat due to the extra rounds that Tiger greats like Hank Greenberg didn't have, but even so, Delmon clearly made some sort of deal at the crossroads. The seventh, eighth, and ninth innings were quiet, aside from a bunch of strikeouts. By game's end, there'd been a combined 25 strikeouts, tying the World Series record (also held by the 1963 Dodgers and Yankees, the 1973 A's and Mets, the 2000 Yankees and Mets, and the 2005 White Sox and Astros). After nine innings it remained unclear whether there'd be another ballgame or not this year, but there would be at least one more inning. Actually, exactly one more inning. Unlikely designated hitter Ryan Theriot led the tenth off with a single, was bunted over the 2nd, and scored on a single by NLCS hero Marco Scutaro. In the bottom half of the tenth, San Francisco's closer, Sergio Romo didn't mess around. He struck out Austin Jackson swinging, struck out Don Kelly swinging (no, I don't know why Don Kelly was batting with the season on the line either), and finally, struck out Miguel Cabrera looking. With that, it was over, a 4-3 victory for the Giants. 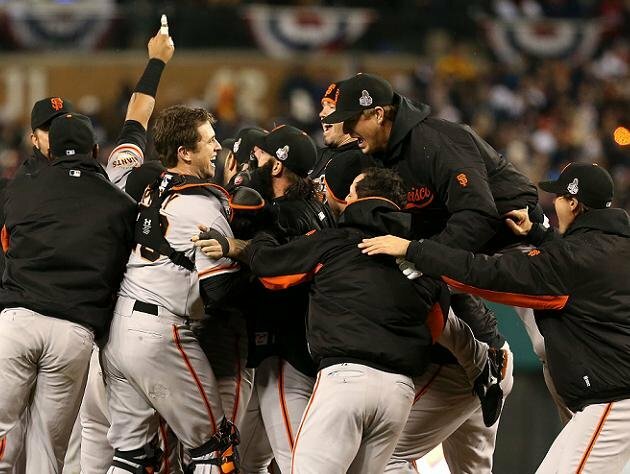 Sergio Romo and Buster Posey celebrated and were soon joined by their teammates near the mound. San Francisco has now won two of the last three World Series. Since the introduction of wildcards into the playoffs in 1995, the Yankees are the only other team to win multiple championships so close together. In my Game 3 recap, I wrote about Detroit's scoring futility. They managed to score three runs in tonight's finale, but still finished with just six total. That's the fewest by any World Series team in 46 years. * - Both the 1907 and 1922 World Series featured a game that ended in a 3-3 tie which was replayed entirely from the start, nullifying those three runs for each team. ** - The World Series was played as a best of 9 from 1919 to 1921. Scoring just 8 runs over seven games probably means that Brooklyn team (not yet known as the Dodgers) probably rates 3rd "best" on a more subjective look at the weakest scoring World Series teams. - Those 1905 Philadelphia Athletics are the only team in history to be shutout four times in the World Series. - The 1918 Boston Red Sox hold the record for fewest runs by the WINNING team, having scored just 9 in their four games to two win over the Chicago Cubs that season. The 2012 World Series will not go down in history is a very good one. Pablo Sandoval's three home runs in Game 1 were certainly the most memorable element of the series, and were plenty good enough to win him the World Series MVP Award. Beyond that, I'm not sure what will stick with me when I think back to this series. Detroit's inability to score, I suppose, and Fielder's special role in that ineptitude. Barry Zito getting a touch of redemption after many rocky years with the Giants is a nice story, especially as it came at the expense of baseball's best pitcher. Verlander's quest for his own postseason redemption will certainly be a popular story line the next time he finds himself in the playoffs. 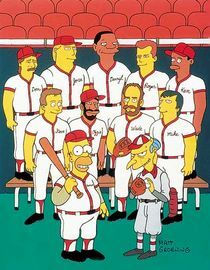 Baseball's off-season brings its own interests and excitements, but none of it is the same as an actual game. I congratulate the San Francisco Giants on a tremendous season. Coming back from down 3-1 against St. Louis and then dominating Detroit the way they did, it's one hell of an accomplishment. At the same time, I'm reminded of something Hall of Famer Rogers Hornsby once said: "People ask me what I do in the winter when there's no baseball. I'll tell you what I do. I stare out the window and wait for spring." If you need me, you can find me at the window.